The Complete Guide for Grammer - E - book download | Improve your spoken English. Learn English. 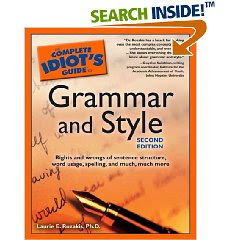 The jokey, conversational style of the Complete Idiot's Guide series is better suited to some of its many subjects than to others, but for the Guide to Grammar and Style, it works. This book might not be appropriate for professional proofreaders in search of the definitive use of the en dash, but it is a solid, amusing volume for those who daydreamed through grade school and would like to brush up on the fundamentals. Puns, silly humor, and hyperbole abound, but so do the entertaining quotations from beloved masters of the English language that author Laurie E. Rozakis has managed to dig up.